Our Costa Rica vacation package The Adrenaline Adventure begins with your first-class, VIP, private airport pick-up from Juan Santamaria International Airport in Alajuela/ San Jose (SJO). "The most heart-pounding tours available in the country!" Your personal Adventure Tours Costa Rica driver will be waiting for you with your name on his placard just below our logo. Climb aboard one of our late model, top-of-the-line, air-conditioned vehicles, and help yourself to a beer, soda or water from your complimentary cooler. Upon your arrival in Jaco, you will be greeted by your Adventure Tours concierge. She will assist your group with condo check-in and provide you with a complimentary local cell phone so we are close at hand for your entire vacation. Adventure Tours Costa Rica’s bilingual and professional team is on the ground and ready to assist you from the beginning to the end of your Costa Rica vacation package. As you settle into your elegant and fully-furnished beachfront condo, you will find that no expense has been spared. Our luxury Jaco condos feature modern kitchens, granite countertops, stainless steel appliances, washers and dryers, flat panel TVs, cable, wireless internet, and personal safes. The incredible balcony views of Jaco and the Pacific Ocean will quickly become the tranquil backdrop for each new day of your amazing adventure vacation package in paradise. After a restful first night, day two of your Adrenaline Adventure kicks off with an off-the-beaten path, one-of-a-kind, private, full-day ATV tour of Costa Rica’s rainforests and backcountry. The Tour del Rey is 100 km of stunning waterfalls, rivers, beaches, lush rainforest, peaceful countryside, and a handful of hidden bars and restaurants that together give you the ultimate authentic local experience. Highlights include your own personal bilingual guide, epic views of the Nicoya Peninsula, and a delicious river-side lunch on the Tulin River. Day three of your vacation package begins with the first of two Jaco Surf Lessons. The surf school will arrive promptly to pick you up and take you to our beach station on the quiet south end of Jaco where the friendly local Costa Rica vibe is alive and well. Each veteran instructor is safety-certified and has spent a lifetime surfing the Costa Rica breaks. Our instructors provide you with hands-on instruction – teaching you at the pace that is comfortable for you. As our VIP guests, Adventure Tours Costa Rica is happy to extend full private beach station access to your group for the remainder of the day. Once you are ready to return to the luxury of your condo, just let your instructor know and off you go. Once you have returned to your condo, we will send in our team of expert masseuses to ease you into an amazing evening of papered restfulness and get you geared up for what comes next. On day four of this Costa Rica vacation package, the sky is the limit as you soar like a bird on a series of adrenaline-filled canopy ziplines. 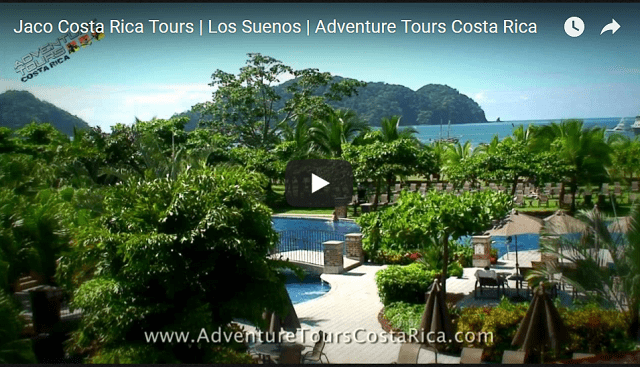 A Costa Rica rite of passage, no adventure would be complete without this exciting tour. From the top-of-the-line safety equipment and certified guides, to the spectacular rainforest views from the elevated platforms nestled in the canopy, our canopy tour is incredible fun. Day five of your vacation package starts early as your private car and driver pick you up for the scenic drive to an action-packed day of white water rafting! Enjoy exciting rapids, canyons, waterfalls, wildlife and primary rainforest in this adrenaline-pumping adventure. Enjoy a delicious authentic lunch, certified guides, and delicious snacks - we’ve got you covered on day five of your amazing Costa Rican vacation package. Day six of your adventure vacation package features your second day of Jaco Beach Surfing. Building on your first lesson, our instructors will help you take your surfing to the next level! If you have always dreamed of learning to surf in Costa Rica, your Jaco surf lessons will fulfill that long-held fantasy in spades. On the final day of your Costa Rica vacation package your private driver will arrive to return you safely to the airport. We doubt you will want to leave, and there is no doubt that you will be telling your friends and family the stories of your time with us for years to come. Please contact one of our agents today for assistance with this amazing Costa Rica Vacation package.